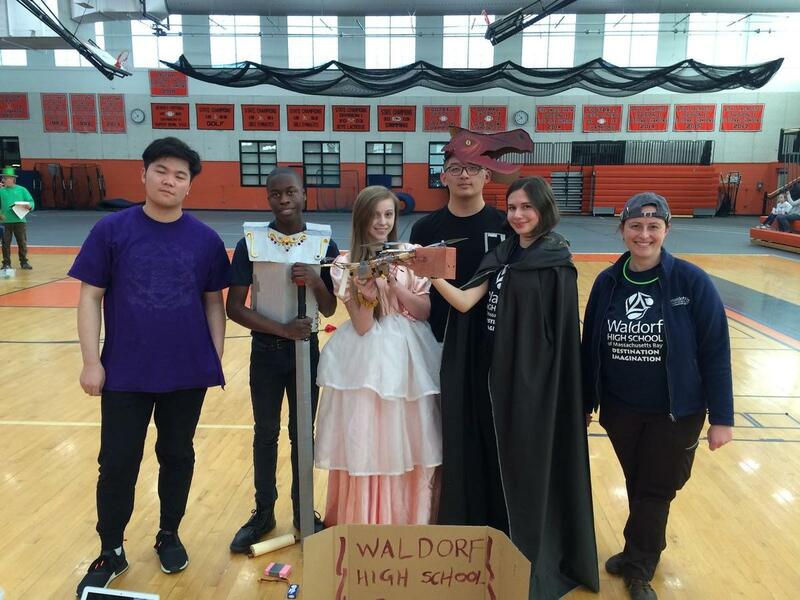 On March 30th, the WHS Destination Imagination (DI) team (Smaranda Costiner, Willow Stoner, Jarius Kidd, Eric Yu, and Robbin Ma) qualified and competed in the state Destination Imagination Tournament in their age category along with teams from high schools across Massachusetts. Our team came in third place in their challenge, which qualifies them to advance to the Global Finals in Kansas City, Missouri. Congratulations! Each team presented their solution to a variety of different types of challenges (technical, scientific, theatrical, improvisational, etc.) This year, the WHS DI team created and built a quadcopter (!) and wrote and performed a medieval melodrama featuring a knight, a princess, and a dragon—all complemented by beautifully crafted costumes and a Spenserian sonnet in iambic pentameter. Photo: Eric Yu, Jarius Kidd, Willow Stoner, Robbin Ma, Smaranda Costiner, Ms. Molly Swanson.